Original installations of theatre pipe organs are a rarity in the 21st Century. Throughout the production period of 1910 to 1939, the combined output of the 30 manufacturers totaled approximately 10,000 instruments. Estimations indicate that less than 300 instruments are left today worldwide of which only 50 are all original installations . The historical integrity of these few “all original” instruments to stay “original” should be maintained at all costs. However, new installations from previously dismantled instruments can offer a different opportunity as well for the theatre that has long lost the original instrument. The theatre pipe organ has evolved musically into a more complicated instrument than it was originally intended. Contemporary professional theatre organists desire modifications of the instrument design which was available to their predecessors. Specifically, a modern theatre pipe organ has much more unification of the stops available on the console and specific ranks of pipes are expected to be separated or grouped into additional wind systems. In addition, many of the original movie theatres have also evolved now and operate as performing arts centers. Consequently, this shift in venue function often requires the organ console to be removable from its once fixed position in the orchestra pit. 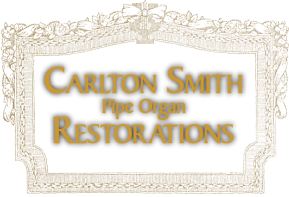 The fundamental philosophy of Carlton Smith Pipe Organ Restorations is to historically preserve the original instrument whenever possible. This philosophy requires viewing our work as a historic restoration of theatre pipe organs, with emphasis placed on the historic accuracy. If keeping the instrument completely historic proves unfeasible, then the mechanical integrity and visual aesthetics of the original manufacturer/builder is paramount. When a complete historic restoration of an existing instrument is not possible or not the requirement of the customer’s needs, alteration and/or enlargement of an existing instrument should still appear and function as the originally installed instrument. Furthermore, once a rebuild of this type is achieved, the console and organ chambers should appear to be an original installation by the original manufacturer. This requires all components of the organ to be of the original manufacturer or reproductions thereof. Likewise, the instrument should be assembled in the exact cosmetic manner of the original company, thus appearing as a completely vintage instrument. This said; modernization and historic restoration are not opposing perspectives. Such an example is the potential need of a modern switching system. Historic integrity would be maintained, however, with all visible wiring wrapped as would have the original vintage cabling. Thus, vintage original aesthetics preserved while providing modern functionality. Concisely stated, in applying the philosophy outlined above to a newly assembled instrument a Wurlitzer theatre pipe organ is still a Wurlitzer. A Robert-Morton organ is still a Robert-Morton. A Barton organ a Barton, and so on. © COPYRIGHT 2015. Carlton Smith Pipe Organ Restorations. ALL RIGHTS RESERVED.